A protest planned earlier in Sweden in connection with the so-called "genocide" of Armenians as well as Assyrians back in 2015 was cancelled. The preparations for the protest in Stockholm was underway during the last few weeks. "The protest didn't take place due to the fact that no one came to participate in it," the State Committee for Work with Diaspora of Azerbaijan said on April 25. 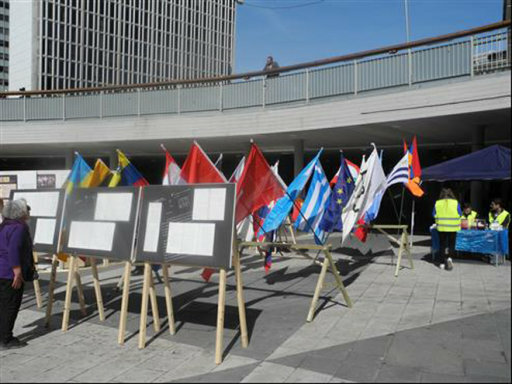 Even the tourists remained indifferent to the event, which was prepared by the Armenian Federation in Sweden and Assyrians in the central square in Stockholm. Five thousands of Armenians and 40 thousands of Assyrians live in Sweden, however, they didn't take part in the protest. Armenia commemorates the alleged "Armenian genocide" on April 24 each year. Armenia and the Armenian lobby claim that Turkey's predecessor, the Ottoman Empire, committed genocide against Armenians in 1915, an allegation dismissed by Ankara. Armenians worked hard for a long time to get recognition for the "Armenian genocide". They are going to celebrate the 100th anniversary of the so-called Armenian genocide. By strengthening their efforts to promote the so-called "genocide" at international arenas, the Armenians have managed to get recognition from some countries such as Germany, Sweden, France, etc. The Armenian lobby is expected to strengthen its activity in the world countries' parliaments, particularly the US. Historians note that back in history, Armenians began an uprising, taking up arms against Turkey. To counter those actions, the Ottoman Empire decided to resettle the Armenians. The latter claims that their predecessors were subjected to genocide.